The United States is the wealthiest country in the world, but the portion of Americans classified as “in poverty” is the largest compared to any other developed country. Politicians dedicate more attention to the middle class, oftentimes, silencing the concerns of the poor. One radio program is helping to provide a voice for the voiceless. 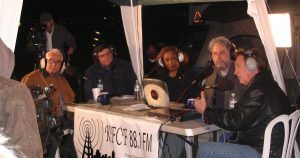 The Homelessness Marathon is an extended, radio broadcast that occurs in community radio focusing on homelessness and extreme poverty in the United States. Program representatives will broadcast conversations from the streets featuring the stories of the homeless as well as politicians, social service providers and experts on homelessness. The purpose of the broadcast is to create a national dialogue where people are speaking about poverty and directing the conversation in a meaningful way. In the 1960s, President Lyndon B. Johnson waged an “unconditional war” on poverty, proposed legislation to decrease the national poverty rate (19% at the time). As of today, however, the Democratic party rarely speaks about anyone below the middle class. Over its history, the Homelessness Marathon has spoken to social workers from other countries to understand how homelessness is handled abroad. Finland developed the Finnish Housing First approach, an initiative to provide permanent housing for the most vulnerable people in the country. From 1987 to 2016, the amount of homeless people decreased from nearly 19,000 to less than 7,000 and there are almost no rough sleepers. According to the US Census Bureau, the rate of poverty is down to 12.7% as of 2016. To put that in perspective, more than 40 million Americans currently fall below the poverty threshold. While the percent of people in poverty has declined, this is a deceptive representation as the pace of the population overall has outgrown poverty and homelessness. The cumulative number of individuals below the poverty threshold (40 million) is nearly identical to that of 1959. The Department of Housing and Urban Development estimates there are more than 550,000 homeless people in America, a figure considered to be a grossly inaccurate undercount by many advocates. The 20th Anniversary of the Homelessness Marathon will be aired from 12 pm to 12 am (EST) on June 12, 2018. WPFW, a sister network of Pacifica, will host the marathon for the second time. For the first time in 18 years, the marathon will not be on the NPR satellite. If your station wants to air the broadcast, Pacifica Ku-band will distribute the marathon. You can also acquire the signal through AudioPort. 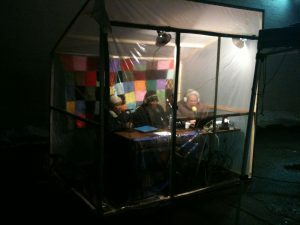 All details and updates can be found at www.homelessnessmarathon.org. Beyond airing the broadcast, stations can send the organization four- to five-minute, pre-recorded segments on specific topics concerning poverty and homelessness. Also, the marathon will accept 10 or 15 minute, live feed segments consisting of conversations with a subgroup of the homeless population or presenting a homelessness-related story.